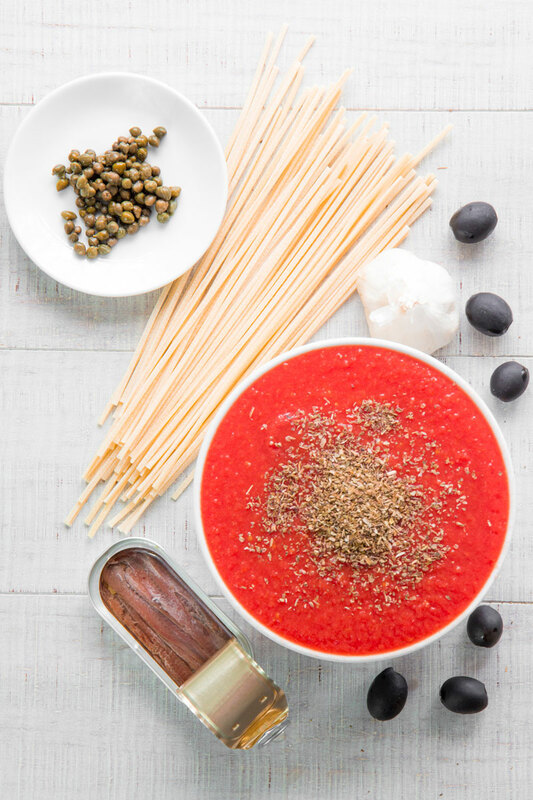 Pasta with Puttanesca sauce is a classic Italian recipe, born in Naples and traditional in Rome as well. Seems that the term Puttanesca originates from the workers of the Italian brothels, called grossly puttane. The legend says, this recipe was created by the owner of one of the many brothels in Spanish Harlem district of Naples, hence the name Puttanesca. A more polite tale describe the adjective Puttanesca as an explanation of the recipe: quick and simple to prepare, and made with easy-to-find ingredients. 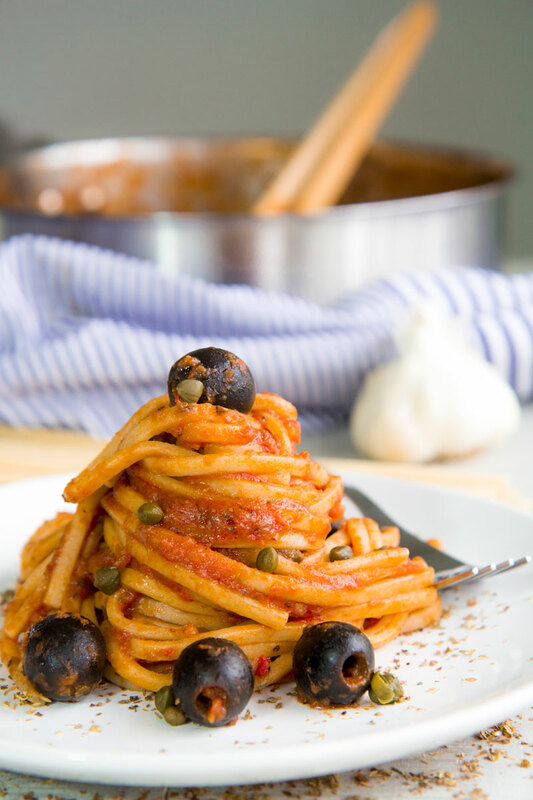 The Neapolitan Pasta Puttanesca requires fresh or peeled tomatoes, and garlic, and black olives, and capers, and fresh parsley. It is also called Aulive e Cchiapparielle (olives and capers). The Roman version is richer, and add anchovies, and a sprinkle of Pecorino Romano. Dried oregano is used in substitution of fresh Parsley. 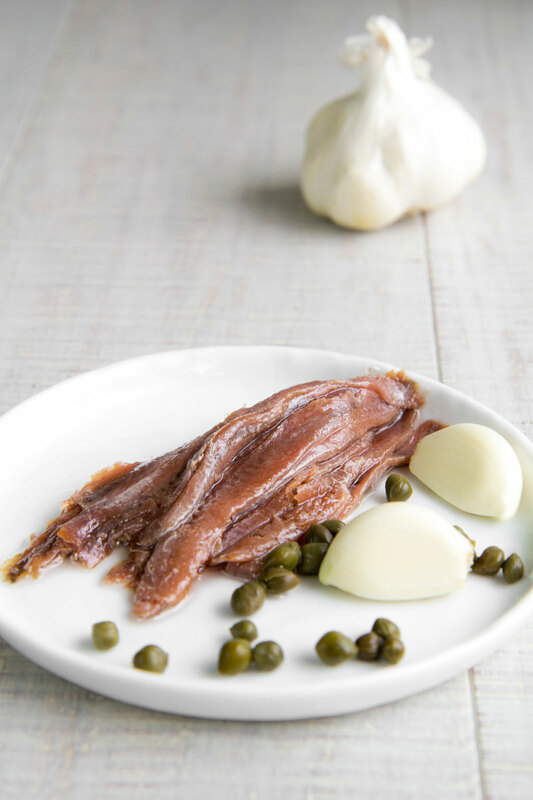 Traditionally, the capers and anchovies are preserved in sea salt. In this case, it’s critical wash and soaks them in fresh water to discard the salt. On the other hand, to make the recipe in an easier way, it is common use capers stored in vinegar and anchovies stored in oil. The best olives to prepare this dish come from Gaeta, a little town near Naples and Rome. 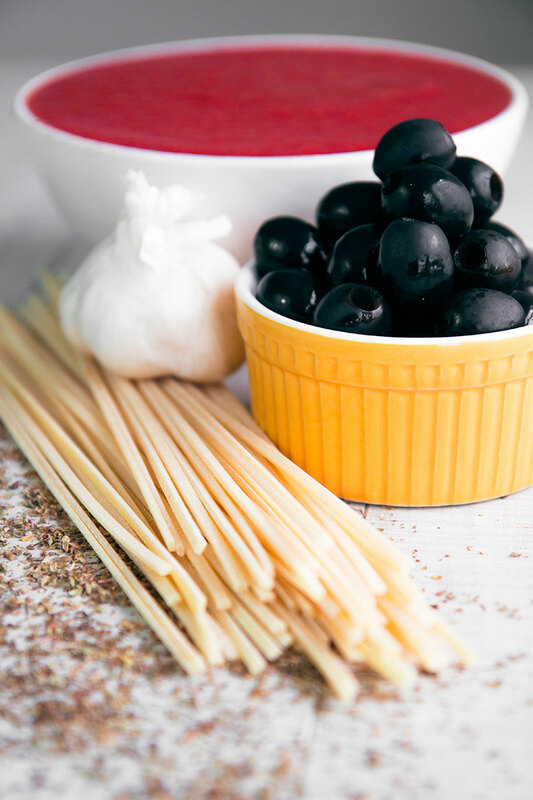 In the absence of them, California black olives are the best option. Kalamata olives are not good for Puttanesca sauce. Tomatoes puree, best if homemade, is preferable to fresh chopped tomatoes. 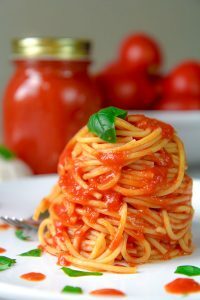 In the Neapolitan version is common use a cherry tomatoes sauce. 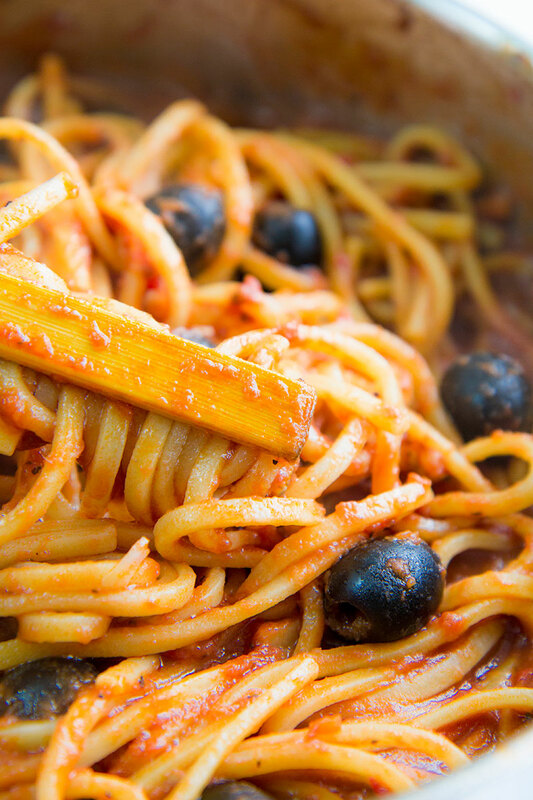 The classic shape of pasta to pair with Puttanesca sauce is Spaghetti. In Rome, it is traditional to toss the sauce with Penne. Linguine, Spaghetti Alla Chitarra and Vermicelli pair perfectly as well. First, rinse and soak capers. Now, Peel and crush the cloves of garlic, then saute them in the olive oil until pale golden. After that, add the tomatoes puree, and cook 15 minutes over low heat. 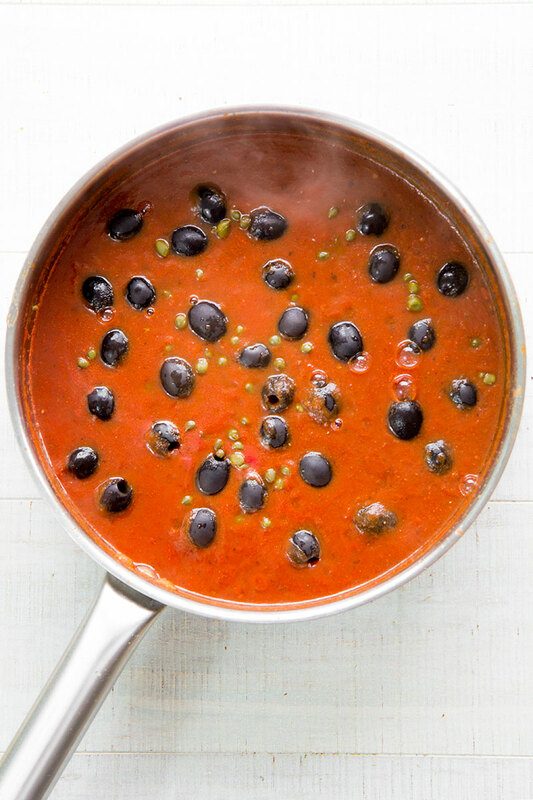 Add the capers and olives, and cook the sauce 5 mins more. Add table salt as needed. Salt 5 quarters of water with rock salt, then cook the pasta and raise it “al dente”. Finally, Toss the pasta with Puttanesca sauce and serve. Rinse and soak salted anchovies and capers into different bowls. If anchovies are preserved in oil and capers in vinegar, just rinse and soak the capers. Peel and crush the cloves of garlic, then sauté them in the olive oil until pale golden. Now, add the anchovies and stir-fry them a couple of minutes, then raise the flame and baste with white wine. Stir-fry the sauce until creamy. After that, add the tomatoes puree and oregano, and cook 15 minutes over low heat. Now, add the capers and olives, and cook 5 mins more. Finally, toss the pasta with Puttanesca sauce, then serve completing with a sprinkle of grated Pecorino Romano. Interested in pasta recipes. 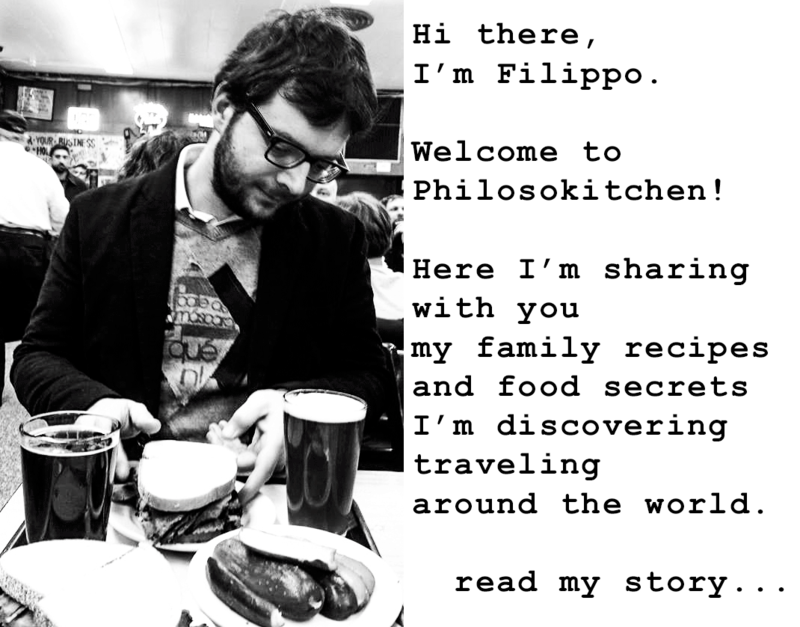 Please provide and other delicious recipes you can share.